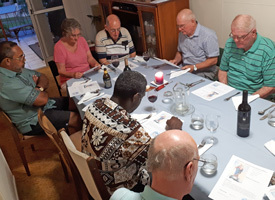 Since 2008 Brisbane Lay Marists, Kevin & Trish McGrory, have invited local Marists to join them in a celebratory dinner at their Stafford Heights home recalling an Oct 29 event of 1824 in France. 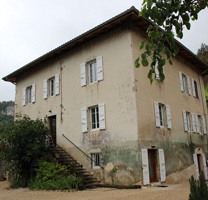 It was then that Fr Etienne Déclas arrived at the Cerdon presbytery (pictured, left) to form, with Frs Pierre and Jean-Claude Colin, the first community of the Society of Mary. 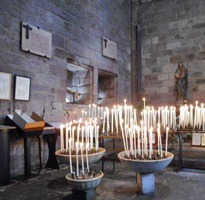 Later that same day, Fr Pierre wrote to the bishop: 'Today the Society of Mary has begun'. 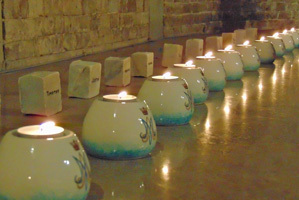 Students belong to all religions, notably Catholics and Muslims. 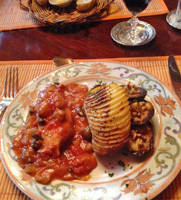 The aim is to develop further the school and include also secondary education. 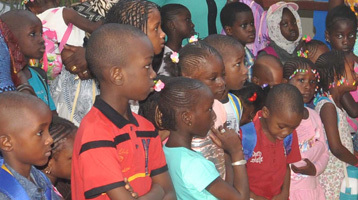 On Oct 09 a new Marist school opened its doors for three hundred children of Dakar, Senegal. 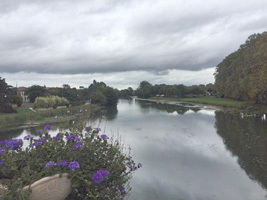 The Cours Sainte Marie de Ndiakhirate is beginning with pre-school and primary children and a fourteen-member teaching and management staff. 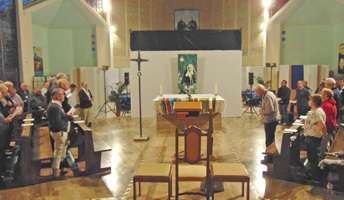 The project was inspired by the Society of Mary’s early vocation to education, and a commitment by Marists of the Africa District to provide more educational facilities for the families of Dakar. 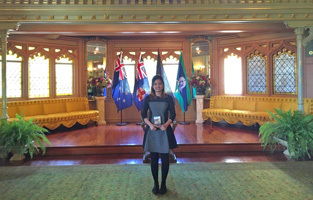 Bridge Program and Australian Catholic University graduate, Muriel Valles, was one of the guests of honour attending an Endeavour Australia ceremony at Sydney's Government House on Oct 23. 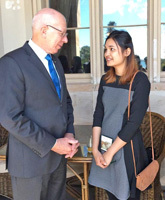 Hosted by His Excellency, General David Hurley, and Mrs Hurley, Muriel and fellow exchange students from Japan, China, Australia and Myanmar were encouraged in their studies and immersion in different cultures and making friends from different parts of the world. 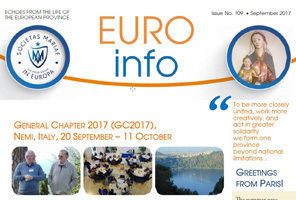 The Endeavour Australia Cheung Kong award program was established in 2004 to enhance partnership between Australia and Asia and to support educational exchange opportunities. 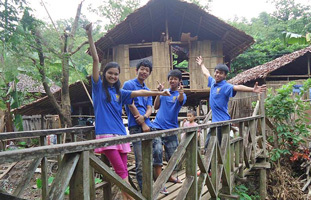 Muriel's educational journey began with the Bridge Program in Thailand's Mae La refugee camp. Currently she is studying at Wollongong University on exchange from Hong Kong's Institute of Education. 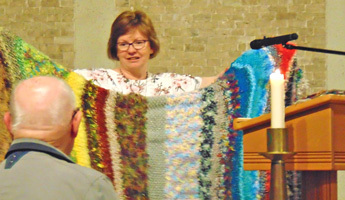 Well done, Muriel. 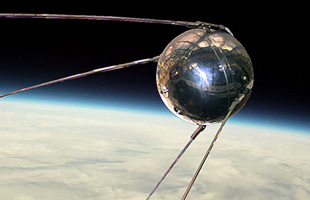 Why me here, and them there? 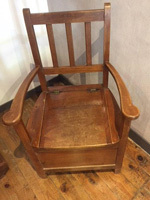 Click here for his recent blog. 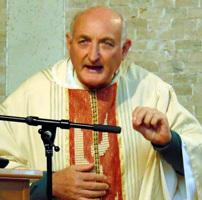 Marist Brother, John Luttrell FMS, has written a biography of the late Cardinal Norman Thomas Gilroy, to be launched on Oct 26 by Archbishop Anthony Fisher at St Benedict’s Hall Broadway, Sydney. 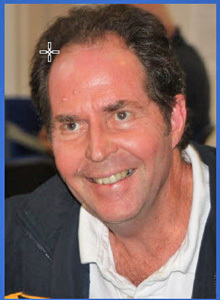 Well done, Brother John ! 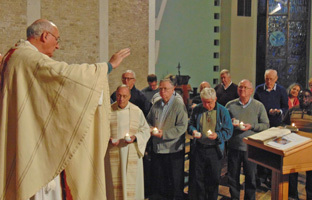 On the closng day of the recent General Chapter of the Society of Mary, there was unanimous support for continuing the Cause for Beatification of Marist Founder, Ven Jean-Claude Colin. 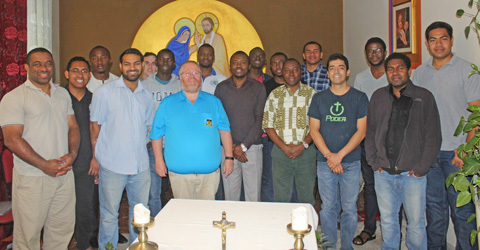 Fr Tony Kennedy (centre) with the community of Casa di Maria / Fellow Australian and newly-elected Assistant-General, Fr Ben McKenna, with Oceanian staff and students at the theologate. 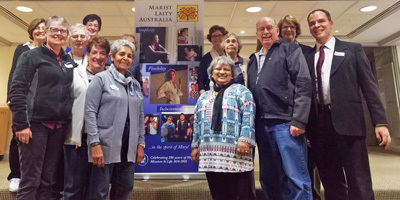 Australian Marist, Fr Tony Kennedy, has been appointed acting superior of the Marist International Theologate, 'Casa di Maria', Rome. 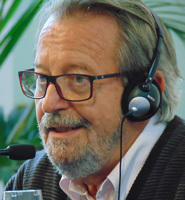 The appointment follows Fr John Larsen's election as Superior-General after leading the theologate community since its establishment in 2012. 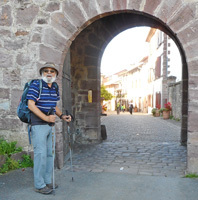 Gratefully trudging into St Jean Pied de Port on Oct 08, Fr Jim Carty has ended his 'Walk for Wilai' after a 700 km adventure raising funds for the welfare of stateless children in S-E Asia. 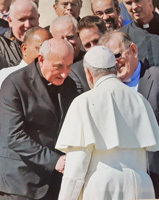 In 2014, 78-yr-old Fr Jim walked the more popular (and easier!) 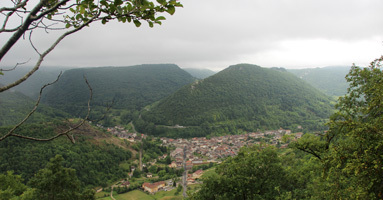 camino from St Jean to Santiago. 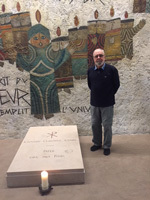 He is now enjoying a well-earned break at the Marist retreat of La Neylière, France. 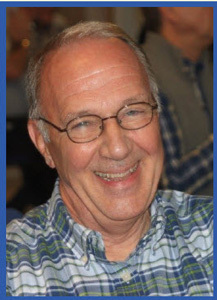 Well done, Fr Jim ! 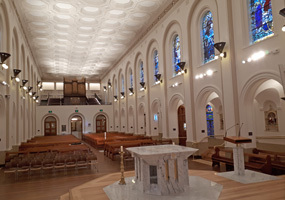 In moving ceremonies, including a closing Eucharist, the General Chapter of the Society of Mary ended on Oct 11. 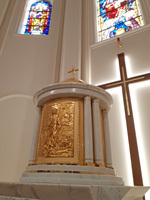 Thanks go to former Assistant-General, Fr Alejandro Munoz, for an excellent photograpic coverage of the entire Chapter. 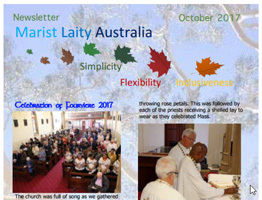 Colourful and newsy: the latest newsletter of Marist Laity Australia. 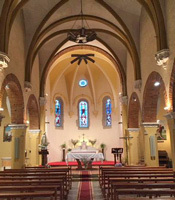 This year's Marian Pilgrimage from St Mary's cathedral, Sydney, to the shrine of St Patrick's, Church Hill, will recall the Fatima appearances of the Blessed Virgin in October 1917. 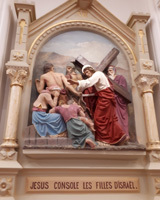 For details of the pilgrimage, click here. 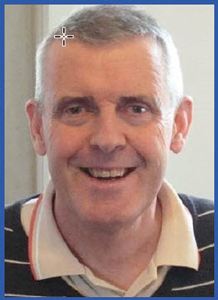 The Marist Fathers have chosen four of their number to act as assistants to the Superior-General, Fr John Larsen, over the next eight years. 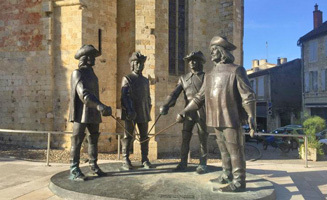 The new Assistants-General are Frs John Harhager (USA), Ben McKenna (Oceania), Juan Carlos Piña (Mexico) and Paul Walsh (Europe). 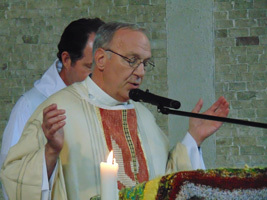 Fr Harhager has been elected as Vicar-General. 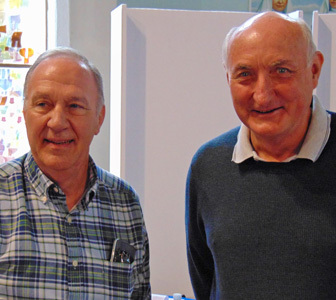 The elections were held during the Oct 06 sessions of the General Chapter at Nemi, Italy, and the news released in a special bulletin: click here. 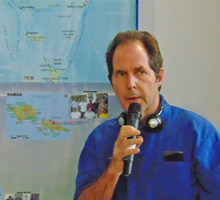 One of the assistants, Fr Ben McKenna, is an Australian. 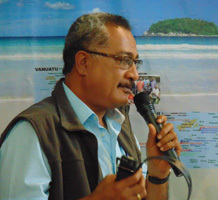 He has been provincial of the vast Oceania Marist province up to the present time. 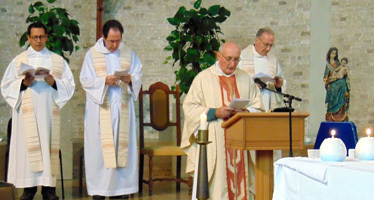 Congratulations to Frs John, Ben, Juan Carlos and Paul ! 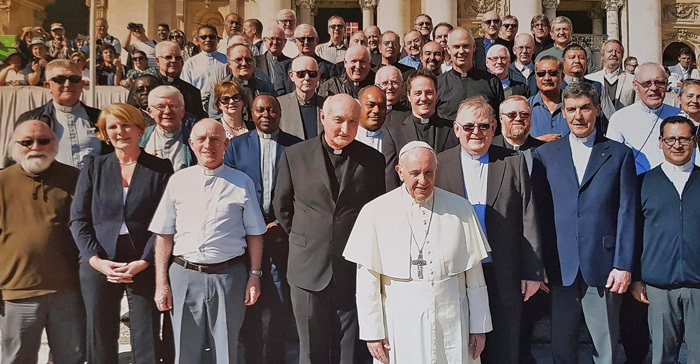 On Oct 04, despite their busy schedule, members of the Marist Fathers' General Chapter squeezed in a visit to the Vatican to meet His Holiness, Pope Francis -- and wish him a 'Happy Feast Day!'. 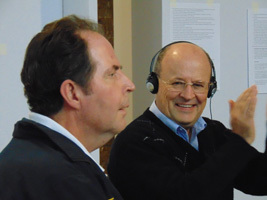 Meeting in Colombia for their General Chapter, the Marist Brothers have elected Mexican, Br Ernesto Sanchez Barba, as their new Superior-General. 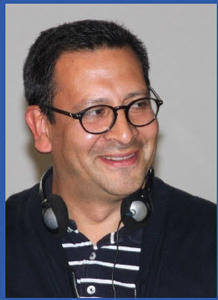 Br Ernesto succeeds Br Emili Turu who has led the Brothers since 2009 and he will be assisted by Vicar-General, Br Luis Carlos Gutierrez. 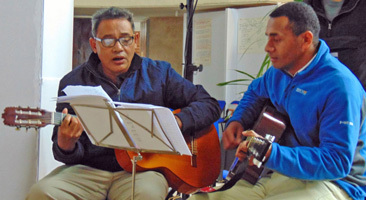 Congratulations, Brs Ernesto and Luis Carlos ! 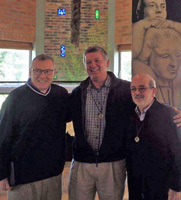 Pictured: Br Ernesto (centre) with former Superiors-General, Brs Sean Sammon (left) and Emili Turu (right) / ...with his Vicar-General, Br Luis Carlos . 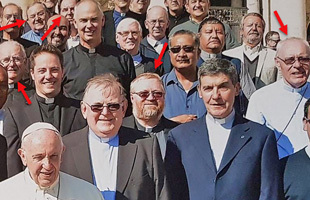 Below: Br Ernesto with Brothers of the Oceania region. 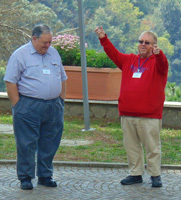 Michael Macquet and Bev McDonald at Nemi / ... with newly-elected Superior-General, Fr John Larsen, at Monteverde, Rome. 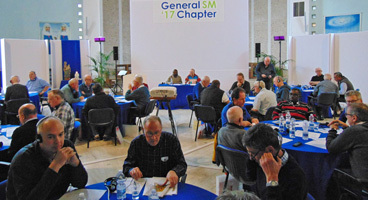 Co-leaders of the World Lay Marist Coordination addressed the General Chapter of the Marist Fathers this week. 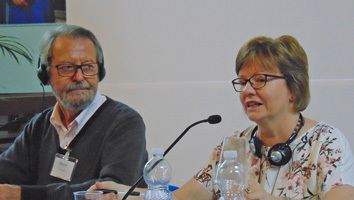 Bev McDonald (NZ) and Michel Macquet (France) engaged with capitulants regarding their identity and mission. 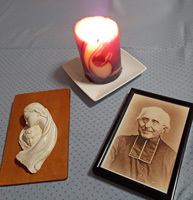 Evening prayer had a special Lay Marist focus and on Françoise Perroton, pioneer of the Marist Missionary Sisters, and who was one of the pioneers of the Lay Marist branch. 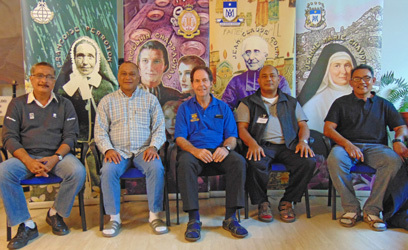 Recent news on the Oceania Marist web site features candid glimpses of six confrères from the Pacific province. 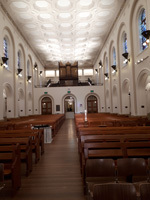 Refurbishment has been completed for the chapel of St Joseph's College, Hunters Hill. 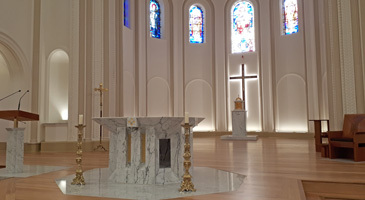 Features include a completely redesigned sanctuary, altar, tabernacle and baptismal font, with lighting facilities allowing for reflective prayer times as well as main services.